Harmony is optimized to ink and paint drawings efficiently. Since most of the drawings are vector-based, the colour zones are completely filled and there are no scattered spots left blank. 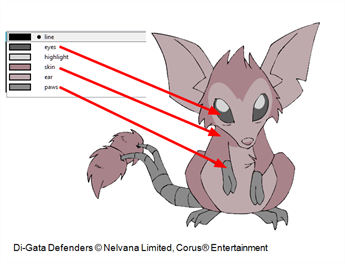 Also, there are some actions that can be applied on an entire animation sequence at once, like dirt removal, some colour filling, line repainting, and so on. When traditional animation is traced, cleaned up, scanned in and properly exposed, it's time for the ink and paint process. This consists of cleaning all dirt and hair (for example, dust that was in the scanner, dots that do not belong in the drawing, extra floating artwork around the drawing that must be removed), painting the lines and filling the colours in the empty zones on an entire animation sequence. For paperless animation, the drawings are cleaned up directly in Harmony, so there is generally no dirt to clean, only painting and inking. Harmony uses palettes to hold all the colours you need to paint your elements. A palette is created by assigning a set of colours to each character, prop or effect. 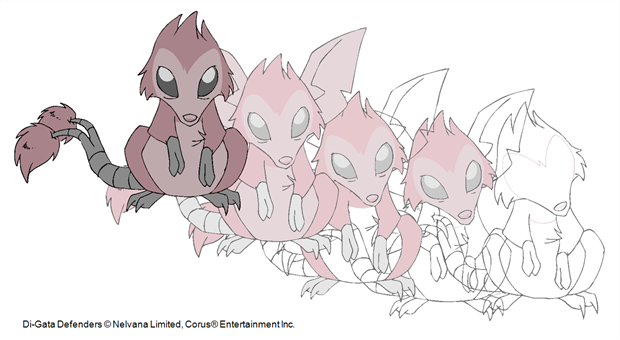 The colour styling artist will create a new palette and add a new colour for each zone of the character, such as the skin, hair, tongue, shirt, pants, and so on. Each colour is known as a colour swatch—see About Palettes.